A recent survey from the Indiana Agricultural Statistics Service showed that horse owners from all segments of the horse industry in that state consider problems in horses’ hooves and legs to be their top priority for future equine research. • 65 percent of working farm operations. Injuries from wounds or trauma, neurological disorders, and obesity were other conditions related to legs and hooves that concerned owners to some extent. Colic, respiratory disease, and infectious diseases were second or third priorities in most industry segments. 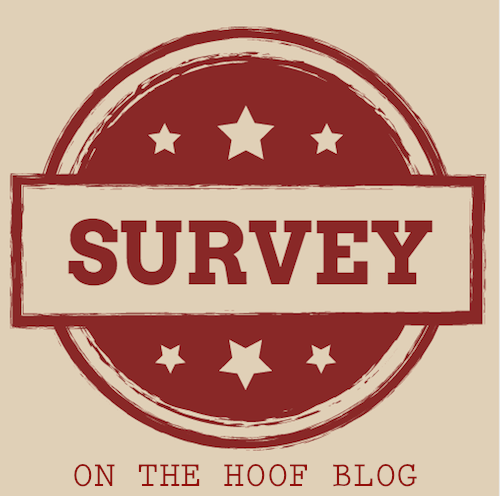 However, no other health concern rated higher than hoof and lameness problems in any of the horse ownership segments. IVAN Floods Threaten Horses in Texas: What Would YOU Do? Floodwaters at the Washington County Fairgrounds in Chartiers inundated stables along the fairgrounds' racetrack, and horse owners who rent the stables had to release their Standardbred horses when fast-rising water rose stomach-high on the horses in the stalls. "It was the heroic efforts by a couple of people to get them released," Wayne Hite, a horse owner and trainer, said, referring to Janis McGhee and Joe Behanna. "Those are real heroes there. They were up to their chins in water releasing these animals." Water flowing swiftly into each end of the stables and exiting through the middle door created the effect of a raging river. Two released horses got caught atop concrete barriers and will be lost for the rest of the racing season, if not permanently, with significant leg injuries. The four stables -- Hite Racing Stables, Bruce McGhee Stables, Sharon Donella Stables and Joe Behanna Stables -- lost tack, 12 jogging carts, six racing bikes or sulkies, helmets, racing colors, a Ford Explorer, a Ford Excursion, a track-maintenance truck, medications, a $54,000 horse spa, farrier equipment and grain and hay. The flood also damaged horse trailers. The loss will exceed $100,000 and could reach $200,000, said Trudy Hite of Somerset Township. "Everything is gone, and it will take years to rebuild," she said. Because the fairgrounds' track was destroyed, the county will have to rebuild it. 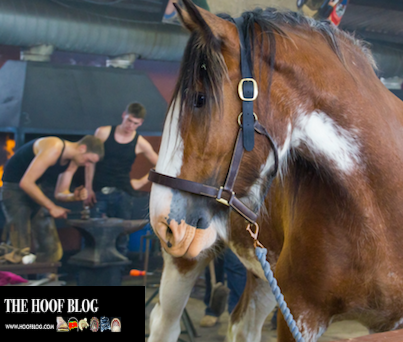 CLYDESDALE SHOEING: Abuse or Standard Practice? EDINBURGH, SCOTLAND—On September 29, 2004 a computer-based horseshoeing evaluation test will compare the gait and characteristics of a Clydesdale horse before and after shoeing with traditional (and controversial) Scottish techniques for the hind limbs. The 2004 International League for the Protection of Horses (ILPH) Scottish Equine Welfare Seminar has tapped the team behind the new Equinalysis gait and shoeing evaluation system to test the horse. According to Equinalysis team leader Haydn Price, DipWCF, the horse has already been shod with its traditional shoes, so any adverse effects of foot dressing will not be relevant. To begin the test, the horse’s shoes will be removed, and the horse will be evaluated barefoot. The shoes will then be nailed back on, and the horse will be evaluated again. Finally, the horse will be shod with full coverage shoes, and the results of the three tests compared. Equinalysis is a system of using video-based computer software to track the movement of joint markers as a horse is walked before cameras recording from different angles. The resulting reports compare stride length, knee action, hock action, straightness, etc. and are helpful in showing the effects of trimming and shoeing on the horse's movement. The system was used to help fine-tune shoeing alterations on horses competing for the United Kingdom at the recent Summer Olympics in Athens, Greece. “Couping” is the name given the practice of nailing on hind shoes that do not cover the horse’s inside heel area. Shaped like a sickle, the shoe has a large lateral calk and exaggerated quarter. These shoes have reportedly been used in Scotland for centuries to help Clydesdales with their work, such as navigating narrow rows of crops. In the show horse world, couping is used to present horses in-hand with hocks that touch; sickle hocks is a desired conformation in the breed. With the help of the shoes and the horse’s generous, an optical illusion is created: the hind legs appear as one limb. While the technique appears to intentionally imbalance the horse, its proponents point out that it is designed for the horse that works in soft ground, where the outside calk is helpful. They also point to the overall soundness of horses shod in this way. Critics point out that the horses sleep in hard-floored stables and must be transported to shows. Price pointed out to Hoofcare & Lameness that while the shoe itself is a radical instrument of imbalance, the hoof is generally prepared according to normal balance parameters, so the test horse can be legitimately tested barefoot, and shod in two different ways without having to re-dress the foot. Noted Clydesdale farrier James Balfour AWCF of Dundee, Scotland is preparing the test horse. Welfare advocates and the Scottish parliament became concerned about couping a few years ago, when a farrier blew the whistle on the practice and called for its elimination. As a result, the Clydesdale Horse Society worked with master farrier David Wilson FWCF BEM and published revised guidelines for hoof balance and shoe coverage, but couping itself was not outlawed. In America, the shoes are generally called “single-calked three-quarter shoes” and are in widespread use for show draft horses. There are no known regulations on how draft horse breeds may be shod and no known public complaints of abuse. Couping was a topic often mentioned by speakers at the March 2003 “Heavy Horse Hoofcare” conference at Tufts University College of Veterinary Medicine, sponsored by Hoofcare & Lameness Journal. More coverage of couping and follow-up of the Scottish Equinalysis test will be published in issue #79 of Hoofcare & Lameness Journal. Equinalysis was recently introduced in the US at a seminar at Rood and Riddle Equine Hospital in Lexington, Kentucky and was featured in issue 78 of Hoofcare & Lameness Journal, in respect to hock displacement in dressage horses. An open seminar using the Equinalysis system will be held at the Rochester Equine Clinic in Rochester, NH on November 4-5. Veterinarians and farriers are invited to attend. Details can be found in Hoofcare & Lameness 78, page 14. Top photo: Clydesdale shoeing at the Royal Highland Show, Scotland, by David McCrone. Hoofcare Publishing file photo. The schedule for the 2004 American Association of Equine Practitioners Convention arrived at the office yesterday. The convention will be held December 4-8 in Denver, Colorado, and of course, Hoofcare & Lameness will be there with a double booth this time in the huge trade show. Here are a few highlights from the schedule that may interest Hoofcare & Lameness readers. Friday 12/3 Foot Surgery wet lab with Kent Carter, Bill Moyer, and Robin Dabareiner--the Texas A&M hoof surgery team--or Advanced Ultrasound with Jean-Marie Denoix, Norm Rantanen, Ron Genovese, and others. Saturday 12/4 1-3 pm "Veterinarian-Farrier Relations Committee" is listed; I don't know if this is an open meeting or not. Stacey and I will be there setting up the booth that day (helpers welcome!). Sunday 12/5 10 a.m. Larry Bramlage presents the "Kester News Hour". This is always fun--a rapid-fire review of veterinary developments over the past year, with some humor thrown in. Sunday 12/5 NOON--Bill Moyer and our farrier friend Bob Pethick will host a lunchtime "table topic" on therapeutic shoeing. Should be great! Also at the same time: Cushings Disease and Hind Limb Lameness. Monday 12/6--get up before dawn (or just stay up) for sunrise sessions on foot lameness, gaited horse lameness, racehorse lameness, laminitis, western performance horse lameness, and a lot more by presenters such as Bill Moyer, Tracy Turner, Scott Bennett, Scott Morrison, Steve O'Grady, Jay Merriam, Rick Mitchell, Reynolds Cowles, Kent Carter, Terry Swanson, Jerry Black and many more. You must reserve in advance! Monday 12/6 1:30 I am looking forward to a group of presentations under the heading "The Unwanted Horse"..but unfortunately at the same time are "how-to" sessions with Tracy Turner, Steve O'Grady and Kevin Keegan on saddle fitting, canker, and head/pelvis movement evaluation in lameness diagnosis, respectively. I won't miss those three, but hope to see some of the welfare presentations, too! Tuesday 12/7 At the same time Sue is presenting, there will also be an imaging panel in progress, with Jean-Marie Denoix, Rick Mitchell, Kent Carter, etc. Tuesday 12/7 Lameness Program begins at 1:30 (unfortunately overlapping with the tearing down of the trade show! Helpers welcome!) with EIGHT interesting lectures including Sue Dyson again, this time of a VERY HOT TOPIC: "Is there an association between distal phalanx angles and deep digital flexor tendon lesions"? My guess is that she will be comparing lateral radiographs showing P-3 angle with MRIs of the same foot showing tendon lesions in the navicular area. This should be worthwhile. Robin Dabareiner (navicular bursa medication results), Scott McClure (shock waver therapy for navicular disease) and lots more in that special section of the convention. Tuesday 12/7 Yes, at the same time, there are medical presentations on Cushings syndrome and thyriod dysfunction, plus Jim Belknap on using COX-2 inhibitors in developmental stages of laminitis. Wednesday 12/8 A terrific program on sacroiliac lameness with Sue Dyson as moderator; speakers include Cornell's Kevin Haussler, Dan Marks, Jean-Marie Denoix. Wednesday 12/8 NOON Table topics on shock wave therapy and a great one on treating sore backs with Dan Marks and Midge Leitch. Wednesday 12/8 1:30 pm Hooray! The Hoof! Rood & Riddle's Scott Morrison (see article in our current issue on maggot debridement therapy) and our old friend (and the only farrier on the program) Bob Pethick from New Jersey will do an afternoon program on farriery, with live horses. In the surgery program that afternoon, Robin Dabareiner will speak on heel bulb lacerations and the UK's Andy Bathe will speak about medial patellar desmotomy cases. Those are just some of the highlights. Also, I don't know what the AAEP's policy is about non-veterinarians attending, so if you are not a veterinarian, you may want to register in advance to avoid late fees on top of non-member rates. Hotels:The Marriott City Center is the HQ hotel, but the Holiday Inn is much closer to the convention center and $50 less per night. Hoofcare rooms will be at the Holiday Inn. At the trade show: Visit the Hoofcare & Lameness booth and learn about the exciting new "in the field" (literally, sometimes) gait analysis system from the UK "Equinalysis", plus new lameness-related or farriery products from St Croix Forge, Harmany Equine, Eponaire, Grand Meadows, and The Smart Boot. PLUS socialize at our booth during book signing events with Joyce Harman (The Horse's Pain-Free Back and Saddle Fitting Book), Hilary Clayton (The Dynamic Horse) and Doug Butler (Principles of Horseshoeing III), to name a few. Block your calendar now! On the first weekend in November 2005 (next year), the 3rd International Conference on Laminitis and Diseases of the Foot will be held at the Palm Beach Convention Center in Palm Beach, Florida. Organized by Dr Jim Orsini of the University of Pennsylvania's New Bolton Center and a committee that includes laminitis researchers David Hood and Chris Pollitt--along with experts like Rob Boswell of Palm Beach Equine Clinic and farrier Rob Sigafoos of New Bolton Center--the conference is well into the planning stages, with two days of lectures and scientific programs and a full day of collaborative practical sessions. A special program for horseowners will be included as well. Information will be available in Hoofcare & Lameness Journal. Please visit the sites below, if you can handle very graphic images of horses in distress. I will write about this horrific event at some point. I'm not quite ready yet, but I wanted to alert everyone to it so you can read about it and make your own judgements. I am sure you will be hearing a lot about this. The photos speak for themselves. I think we all need to speak for the horses. This week's visitor is from Argentina! We've had the pleasure of a visit from Dr Federico Oyuela this month. Federico is a foot-specialist veterinarian in Buenos Aires, Argentina and runs the farrier school (Escuela Argentina de Herradores) there. One of his areas of interest is working with the only hyperbaeric oxygen chamber in Argentina. We have been discussing the use of this type of therapy for horses with laminitis, and I hope he will soon have some research to share. I know that the Alamo Pintado equine hospital in California also uses their hyperbaeric unit for laminitis therapy. Federico visited veterinary colleges in the eastern USA, as well as the Kesmarc equine therapy center in Lexington, KY and our friend Dr Scott Morrison at the Rood & Riddle Equine Hospital in Lexington. Federico is both a veterinarian and a farrier; he attended the farrier school at Tucumcari, New Mexico where he learned from Jim Keith, and then went on to do specialty training in Arizona with Dr Jan Young. 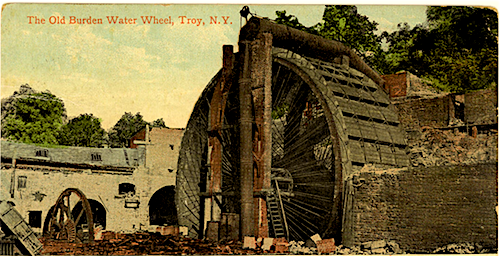 The once-grand water wheel that powered the Burden Water Works in Troy, New York and made the horseshoes often credited with powering the Union to victory during the Civil War. It's either too hard or too soft. Too dry or too wet. Anyone who has ever worked in show management knows the importance of good footing, particularly for outdoor show jumping. This weekend, Hoofcare had a booth at the Southern New England Farriers Association's fall clinic in Connecticut, where I ran into Dr Doug Butler. He has completed a revision and re-design of his textbook, the third incarnation of PRINCIPLES OF HORSESHOEING, nickname "P3". His son, Jacob, is listed as co-author, which is nice. The book is handsome and heavy and full of photos. 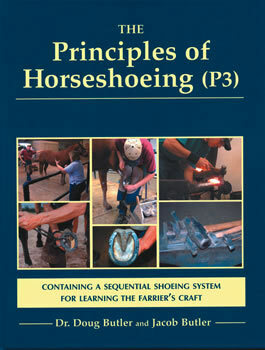 It is a major revision of "P2", which has become the standard textbook used in horseshoeing schools around the world and as a reference by farriers. We hope to work with the Butlers and market this book through Hoofcare & Lameness. Check with Hoofcare in October or November to see if this happened. 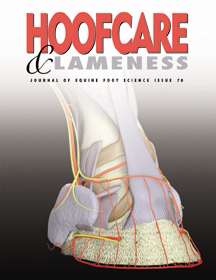 Hoofcare & Lameness, Journal of Equine Foot Science, Issue #78, was mailed in August 2004. Fran Jurga's Hoof Blog is born! This day won't be remembered for the launch of this blog. Instead, it will be remembered for Hurricane Ivan (the Terrible?) and his imminent attack on the shores of Mississippi and Alabama. I've heard from a few Hoofcare & Lameness readers tonight who live in the storm's path, and I'll thinking of them in the next few days. I will use this blog to help readers of Hoofcare & Lameness Journal get the inside track on news and information as it whizzes through our offices. I know that subscribers are keen to know many details of things going on in the horse health and horseshoeing world that may not make it to the "news" section of our journal, or even to a news item posted on our web site, hoofcare.com. What will appear may be just fragments of news, ideas for stories in progress, or pleas for help. Of course, I've never done this before, but I think the best thing to do is just jump in and see how it works, how readers like it, and what good use we can make of this fun medium. Please don't take it TOO seriously. As with all things here at Hoofcare & Lameness, we ask that you consider the possibility of errors and not mistake the information posted here as professional or medical advice. The information posted here is not meant for re-publication and may not be copied or posted elsewhere without the express written permission of Hoofcare Publishing. 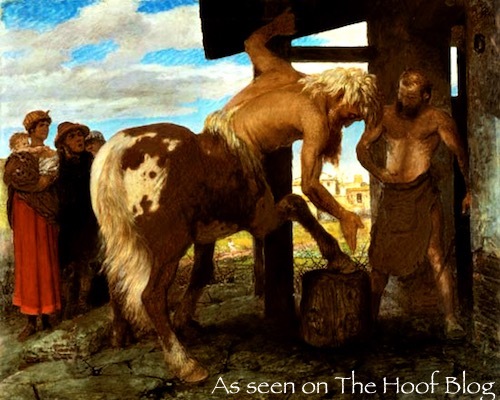 Art at top: Swiss artist Arnold Bocklin's "Centaur in the Village Blacksmith's Shop" was painted in 1888. © Museum Of Fine Arts, Budapest, Hungary, used with permission.